Light & golden. Served with whipped butter & hot maple syrup. From the Mother Lode country, chewy and tender. Served with whipped butter and hot maple syrup. Served with whipped butter & hot maple syrup. Freshly ground Idaho potatoes in a special batter. Served with sour cream or applesauce. Authentic lacy Swedish pancakes served with Lingonberries from Sweden and whipped butter. Buttermilk pancakes filled & topped with real bits of bacon. Served with whipped butter & hot maple syrup. 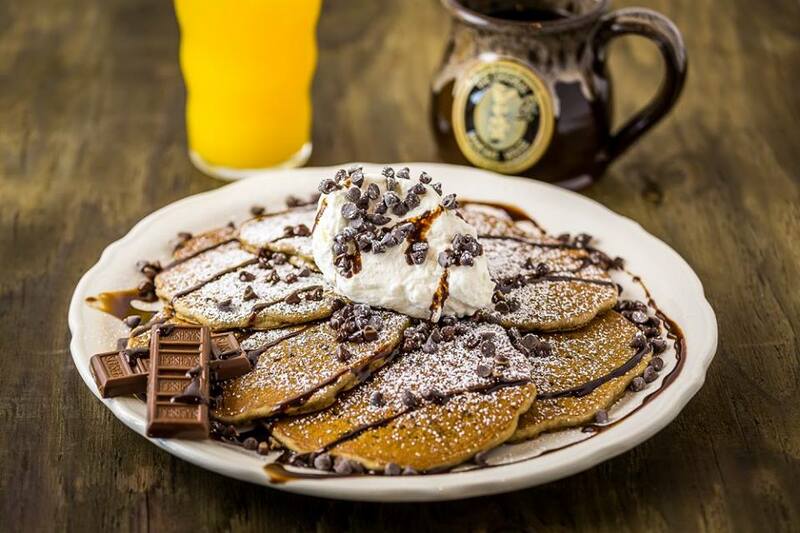 Buttermilk pancakes filled & topped with diced bananas & lightly dusted with powdered sugar. Served with whipped butter & hot maple syrup. Buttermilk pancakes filled with plump blueberries and lightly dusted with powdered sugar. Served with whipped butter & hot maple syrup. 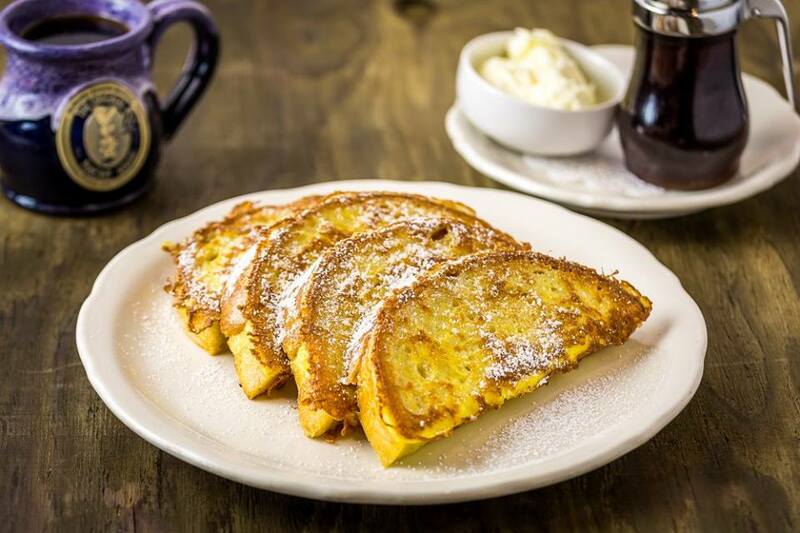 Thick sourdough bread dipped in an egg batter with a touch of Amaretto and dusted with powdered sugar or cinnamon sugar. 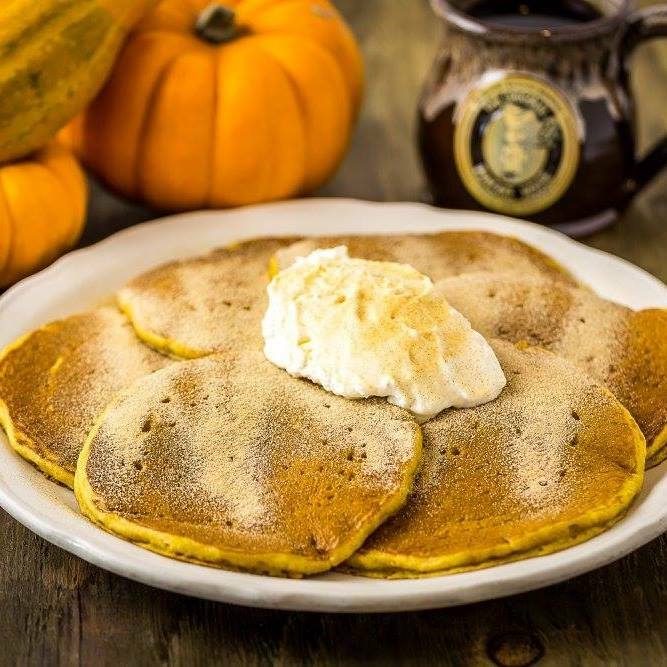 Buttermilk Pancakes mixed with pumpkin pie filling, dusted with powdered sugar or cinnamon sugar. Filled and topped with hot toasted pecans & lightly dusted with powdered sugar. Served with whipped butter & hot maple syrup. Buttermilk Pancakes filled and topped with diced bananas and toasted Georgia pecans. Two large farm-fresh eggs and four buttermilk pancakes. Served with whipped butter & hot maple syrup. Our special links wrapped in light buttermilk pancakes, lightly dusted with powdered sugar & served with whipped butter & hot maple syrup. Hershey’s chocolate syrup and chocolate chips added to our buttermilk batter. Served with fresh whipped cream. Ten delicious silver dollar pancakes. Served with whipped butter & hot maple syrup.